​My artwork is an abstract portrait, with warm colors against a black background. 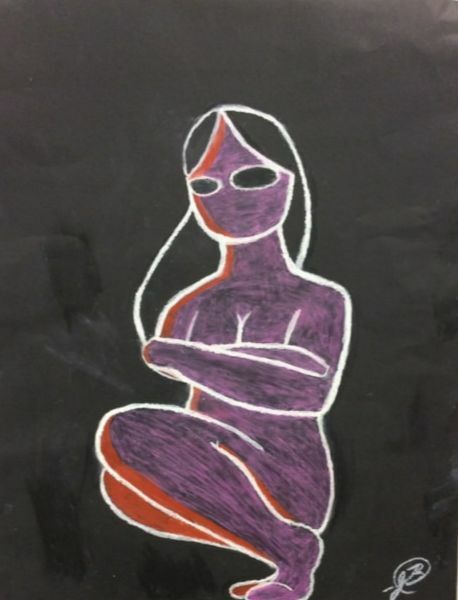 I used oil pastels on a black posterboard. First I did a light sketch in pencil, and went over the outline in white oil pastel. I did the pink first, rubbing it to create a waxy look. I did the shading by putting rust on top of orange. If I made a mistake, I would go over it in black pastel. The big idea behind my work is to challenge the idea of beauty. By using a popular modeling pose and recreating it with abstract techniques, I make the viewer rethink the definition of beauty. My goal with this artwork was to get experience with oil pastels. And honestly I love how it turned out. I put a lot of work and thought into this and it came out great. I used "The Girl with a Pearl Earring" as my source of inspiration. 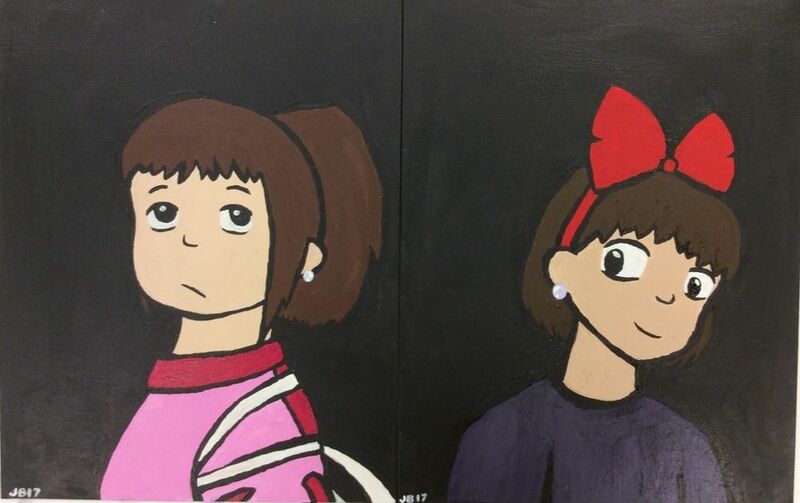 I decided to use characters from two Hayao Miyazaki films, Chihiro from Spirited Away (Left) and Kiki from Kiki's Delivery Service (Right). I used these characters because I hold them near and dear in my heart. I watched Kiki's Delivery Service as a child and fell in love with the movie and the main character. I didn't watch Spirited Away until much later in my life, only a few years ago. But the film was so magical and exciting that it earned a spot on my list of favorite movies. I used acrylic paint in order to get that flat 2D look that the original movies have. On Chihiro's picture I attempted to do some cell shading on the clothes and I like how it turned out. On Kiki's picture I tried to make it look a little more like the original painting with texture and such. For this project, I used clay to create a pencil holder that empathized on the Element of Lines. In my planning period, I planned for the lines to be more detailed and complicated. However, as I started making my pencil holder, it was difficult to make sure the detailed lines were steady all around. So, I went with simple lines around the pencil holder and used curved lines for the details in the turtle's shell. I chose white for a simple color for the holder itself, and blue for the turtle, since it's my favorite color, and this is my favorite animal. It was difficult to make sure that the holder's thickness was constant, but Ms. Schuuman showed me a technique that helped me even it out. Overall, I'm happy with how this turned out, considering I don't have much luck with clay. I made this doll house from an old book, Popsicle sticks, toothpicks, wires, felt, a cereal box, paper, marker, hot glue, watercolor, Styrofoam, and a pom pom. I spray-painted the book and held it up by gluing two Popsicle sticks, and I used paper for the wall, and felt for the floor. For all the furniture, I worked on the moving parts first by making a hole in two Popsicle sticks, cutting them to size, and putting wire through them. My original plan had the book able to close, but I realized that wouldn't happen with all the big pieces. To make the window, I made a square from the cereal box, and cut up a toothpick to make it 3D. I then used Popsicle sticks for the outside, leaving a slit at the top. I used crayon and watercolor for the skies. I made a small painting to fill up empty space by using marker on a cereal box and using a leather trap and wire to attach it to the book. I used Styrofoam and felt for the cushions/pillows. For the storage table, I used the cereal box and masking tape. The most difficult part was the futon, since it was my first time making miniatures with moving parts. Sometimes the Popsicle sticks would break as I made the holes so I had to glue them back together. But for my first miniature scene, I'm impressed with how it turned out. For my second choice project, I decided to redo an earlier exploration piece. I also used this exploration for "Modeling". In this earlier piece, I used more surrealism and used oil pastels against black paper. This time, I wanted to use acrylics, and have it fit with the theme of "Summer". I began by painting the canvas yellow, like the sand on the beach or the sun. Then I made the person in pencil and painted over the pencil lines in acrylic. After the acrylic dried, I erased any stray pencil marks and added my signature. I'm really happy with how this turned out, and I think I really found my place in surrealism. I'm glad I explored it in the beginning and then revisited it. ​For my inspiration project, I decided to do something that really spoke to me. I based it off a quote by Frida Kahlo, "They thought I was a surrealist, but I wasn't... I never painted dreams. I painted my own reality." I decided to make pins from Shrinky-Dinks and pin-backs. First, I designed the pins on a piece of paper, then drew them on the Shrinky-Dink paper. For the North Carolina one, I had to trace and image off the internet. Then I baked them according to directions, and when they cooled, I glued the pin-backs onto them. It was super cool to watch them shrink, and I loved the way they came out. ​For my second and final part of the Inspiration project, I made a doll of Frida Kahlo. I began by using aluminum wire to make a base, then I used polymer clay to sculpt the body. I baked the hands and the head first, and while the body baked, I made the face with sharpie and paint. Once the body finished baking, I glued the hands and head on with hot glue. I did some research on Frida Kahlo's clothes and began making an outfit. I used blue fabric and lace for the skirt and put it on with a running stitch. I took some red and white patterned fabric and used water color to make the white a light red. I glued on the shirt and sleeves, then used red yarn to hide the edges and prevent fray. I made the shoes from black felt. To make the stand, I took a plastic lid and glued corks on the bottom. I slit a hole and put a wire through it before gluing it into place and gluing another piece of wire to it. I then painted the whole thing gold and used gold buttons to decorate it. I am really proud of how this turned out, though I wish I did better on the clothes and took more time with them. But overall, I'm happy with it. My name is Jessica. I have been drawing for 9 years and enjoy showing off my work. I love to work with Oil Pastels, although I often just sketch.